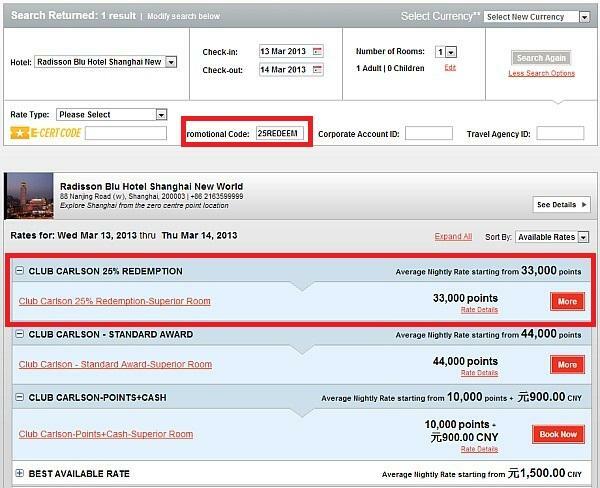 When you make the award reservation, make sure that you have 25REDEEM promotional code inputted. You will then be presented with the standard and promotional award rates. Club Carlson has been very active on the promotional side for the past 24 months. They have had 50% off of award sale quite often in Europe, but this is first time the have something like this in Asia. You have to decide if it makes sense to save 25% on number of points used for a standard award, use cash & points, or to pay altogether. This 25% Off Award Night promotion (“Promotion”) is available to Club CarlsonSM members only at participating Radisson Blu and Park Plaza® hotels in China (see above list for participating hotels) for Award Night stays booked and completed by 30 April 2013. The Promotion must be booked using your Club Carlson member number and promotional code 25REDEEM at clubcarlson.com or by phone with hotels directly. This Promotion reduces the number of Gold Points® normally required to be redeemed for a standard Award Night by 25%, as determined by the applicable hotel redemption category. The Promotion is valid for standard room Award Nights, is subject to availability, and blackout dates apply. Member must have the minimum number of Gold Points required at the time of booking to participate in the Offer. Points + Cash bookings are not eligible for this Promotion. This Offer, and your membership in Club Carlson, is subject to all Club Carlson Program Terms and Conditions; if you are not a member, enroll at clubcarlson.com. The Offer is not valid for existing reservations. We reserve the right to add, modify, or discontinue this Offer with or without notice. Offer is void where prohibited by law. By booking the Offer, you agree and consent to these terms and conditions.